In an ideal world, all we would have to do is show up at conventions and get massive traffic coming to our trade show booths. That does sound perfect, but not realistic. To get the results and the traffic you want at trade shows, promoting your trade show booth is critical. As important as this rule is, not nearly enough exhibitors follow it. Here are a few guidelines to remember when you are promoting your trade show exhibits. 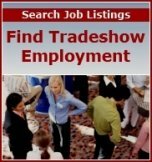 Begin advertising at least one-to-three months before the trade show. This way, your target audience will have ample time to prepare for the upcoming event. Have a goal in place and let your staff know what it is. Whether you want a certain amount of sales or leads, bringing awareness to your business, or networking, knowing what you want to get out of the event is a must. Use social media to promote your trade show display by following certain hash tags, engaging other attendees and exhibitors, and posting your booth number to make it simple for attendees to find you. Take out ads in area newspapers or broadcast outlets. Although an increasing number of people are using the Internet as a primary source of information, print, television and radio can still be effective for getting get your company name out and trade show booth recognized. These are just a few ideas to help you promote your trade show displays and increase traffic. One study reported that about 76 percent of attendees have an agenda before getting to the convention and know what trade show exhibits they want to see. Make your way on their agenda by properly marketing it.